Representatives of the Latvian National Commission for UNESCO visit the Daugavpils University Faculty of Education and Management and the Institute of Sustainable Education . 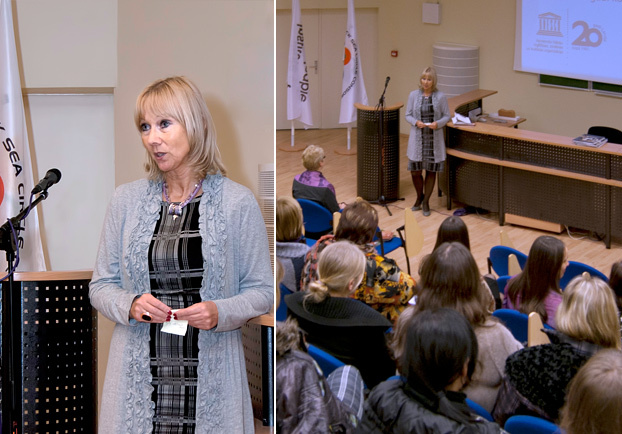 On December 19, 2011 at the Faculty of Education and Management and Institute of Sustainable Education an open meeting was held in honour of the 20th anniversary of the Latvian National Commission for UNESCO and the 90th anniversary of Daugavpils University. During the event the newest issues of the scientific journals of the Institute of Sustainable Education were presented: “Journal of Teacher Education for Sustainability” (included in data bases Scopus, CABI, Educational Research Abstracts Online (ERA), The Central European Journal of Social Sciences and Humanities (CEJSH), Higher Education Abstracts) and „Discourse and Communication for Sustainable Education”. The students and candidates for the scientific degree of the doctoral study programme ‘Pedagogy” presented the results of their recent research. The event was also highlighted by the demonstration of a video prepared within the Year of Ethics of the Latvian National Commission for UNESCO. Thank you to everyone who celebrated the 90th anniversary of Daugavpils University and 20th anniversary of the Latvian National Commission for UNESCO together with us!